Background – As a runner, if you’ve had problems with blisters on your feet, you might have sought relief in the form of sticking plasters and other types of blister protection (which is already a bit late in my opinion). You have hopefully had your shoes correctly fitted at a specialised running shop and bought sweat wicking compression type socks, which can both also help prevent blisters on the feet. Unfortunately these precautions and temporary solutions do not always hold out for longer distance runners and the inevitable happens! Now if you ARE a long distance runner you will also know that you cannot afford to take much rest time off from running to allow said blisters to heal. Enter Striderm Ultra Pace Foot Balm! I had been an avid user of Vaseline (petroleum jelly) on known trouble spots on my feet with a pretty good success rate. However, once my longer runs started getting up over 30km, I soon found out anything can happen! I started getting blisters on/in between places on my toes that had never troubled me before. 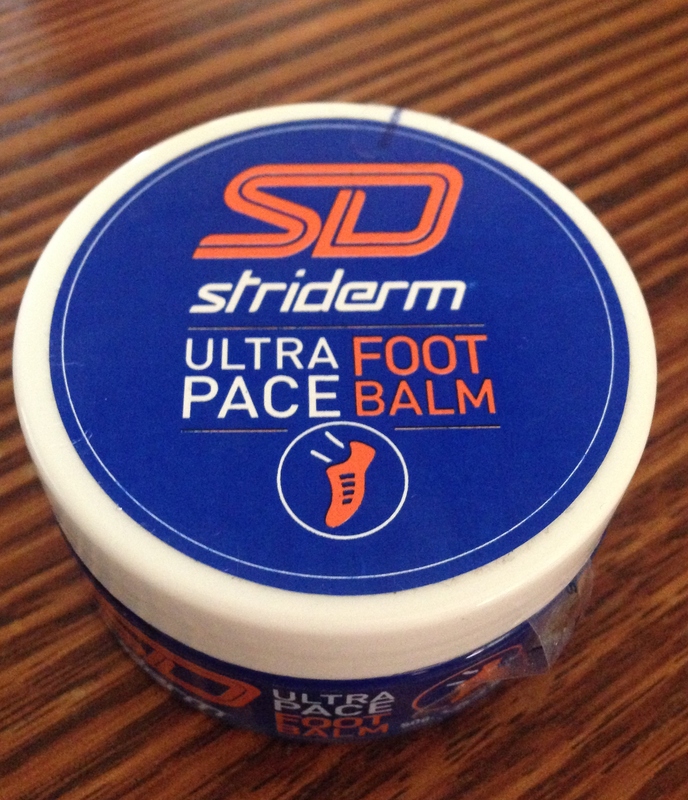 Description – The SD Ultra Pace Foot Balm comes in a small tub and as soon as you open it there is a really nice smell. The texture is creamy as opposed to the greasy texture of petroleum jelly. It is thick, but not too thick, easily applied and easy to get off your fingers with a baby wipe or warm soapy water after application. Once socks are on, the foot balm does not feel slippery, actually you cannot feel it is there at all. 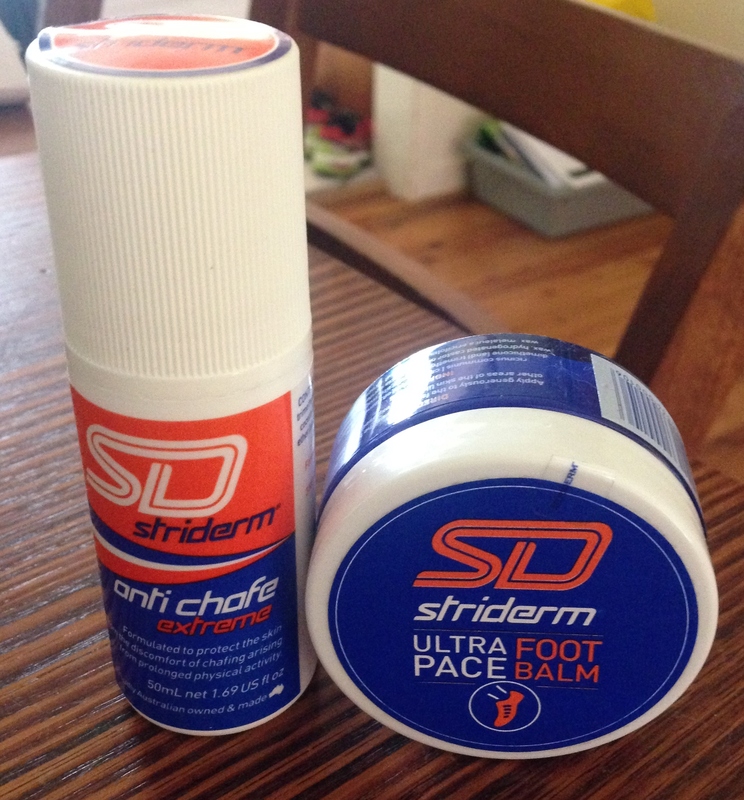 Verdict – After many long distance runs using the Striderm Ultra Pace Foot Balm, I can say I have had a 100% success rate! I’ve had no blisters or trouble with my feet at all across all distances up to 50km. I would definitely recommend giving it a try if you haven’t yet found a successful product. Background – As per the foot balm, in the past I have used petroleum jelly in an attempt to ward off chafing in my known trouble spots, which need not be gone into in full detail 😉 Some of our other Rachel’s Runners members have used a variety of methods to avoid chaffing, including, but not limited to – sticking plasters, Elastoplast, kinesio tape, paw paw ointment and alternative clothing to that which seems to cause the worst response from the continual friction that running causes. 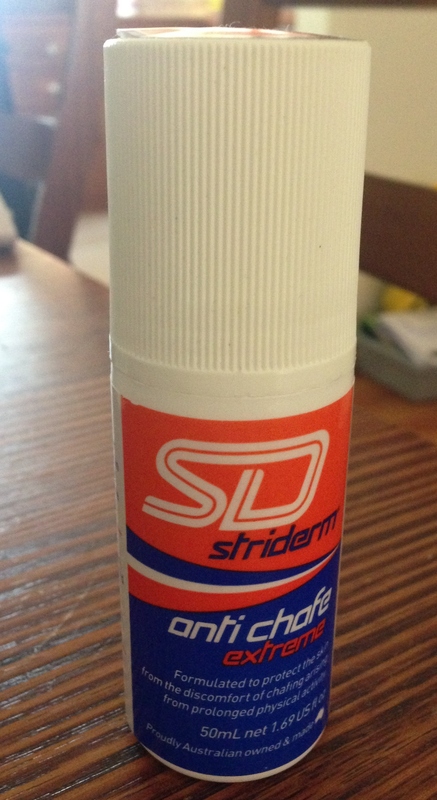 Description – The Striderm Anti-Chafe Extreme comes in a roll on container similar to that of a small deodorant bottle. It has a clear, shiny texture, without being greasy. It is water resistant and can be used on the feet as well as other parts of the body. It can also be applied under clothes and socks or running belts and phone arm bands without leaving any grease marks or imprints. This product is also suitable for use under compression wear, wet suits and tri-suits. Verdict – I found the Anti-Chafe Extreme easy to apply with the roll-on applicator. It’s not too greasy and did the job it was designed for. I have not had any chafing in problem areas since using this product. If any spots have occurred elsewhere during a long run, I have used the Anti-Chafe Extreme the following day on the area without further problems, and also without any stinging on application. As mentioned earlier I run distances of up to 50km in length, so I can vouch for this product’s anti chafe ability over a long period of time.